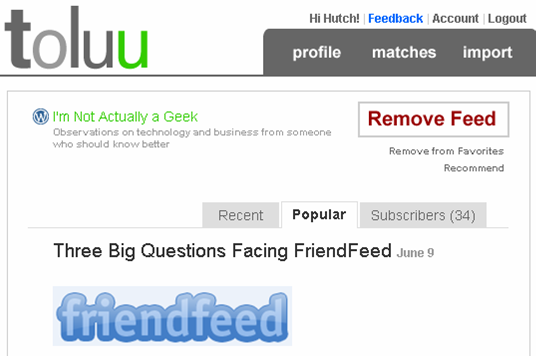 ← Will Brands Figure Out FriendFeed? I’d like to get a little more info about some of these blogs in a summary fashion, without having to click each one. The new features providing context around a blog are particularly interesting for me. Let’s look at those. Here’s a screen shot of the page for a blog before the updates. The most recent post for the blog is shown, without any date information. Next, the same screen with the updates. Below, you’ll see new tabs for the blog: Recent, Popular, Subscribers. Also, note that the post for the blog now has timestamp information (“Yesterday”). With the addition of the tabs, you now have quick access to more information about the blog. As you’re checking out whether to subscribe to the blog, you click on the Popular link. This is pretty nice. The blog’s most popular recent posts are shown. At a glance, the user can see if the blogger’s top stuff is interesting. A good way to gauge what animates the blog. The list shown for this blog is a pretty good indicator of popularity. Subscribers = Who Else Likes this Blog? This feature is really cool on a couple fronts. As a user deciding whether to subscribe to a blog or not, the list of subscribers provides a reference of sorts. Who feels like there’s enough “there” to warrant a subscription? You can see what other blogs the subscribers have added as well. 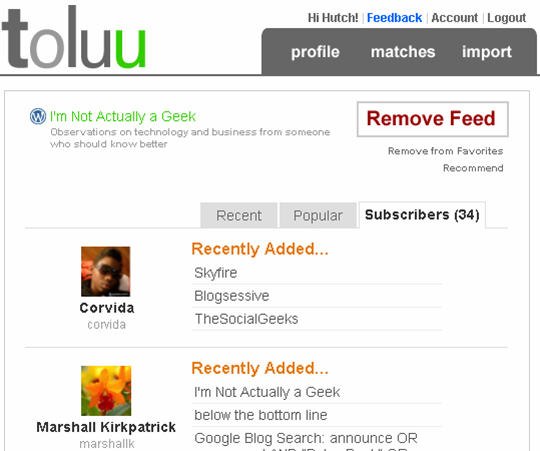 For example, I see that Corvida added Blogsessive. I checked it out, and decided to add it myself. 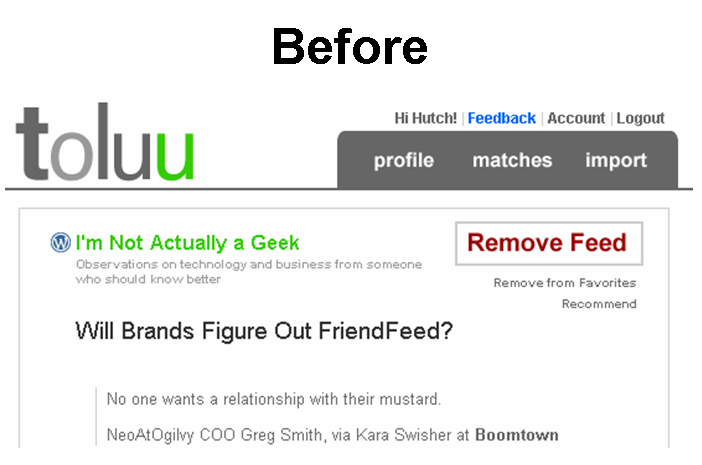 A really nice way to leverage the filters of others in finding blogs you may like. As a blogger, I also find this feature very nice. You may know your number of subscribers, but do you know who they are? Well, with Toluu, it’s pretty easy to see who some of them are. These changes are a great step forward in helping you decide which blogs warrant your subscription. Better sense of the blog’s content. Better sense of the crowd that likes a particular blog. My wishlist still includes better macro, summary recommendations for blogs. But all in due time. Hats off to Caleb and team for adding these excellent features. Also – I invite you to check out my Toluu page: toluu.com/bhc3 If want an invite, just leave me a comment. You really nailed all of the really interesting things we see can happen with these new features. Enabling easier discovery of interesting feeds is at the core of Toluu and these new additions further that. 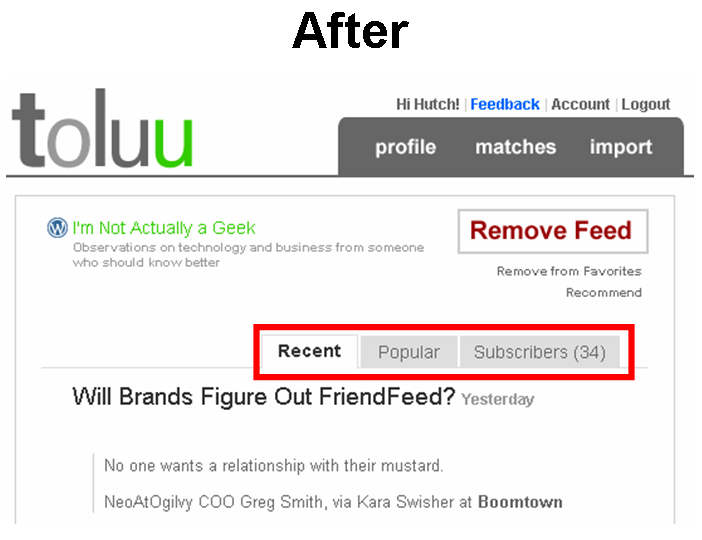 We certainly will continue to expose more useful data around feeds and create more views to discover feeds on Toluu. Pingback: Toluu Blog » Blog Archive » Record setting day for Toluu! Hi — Toluu looks like a useful site. I’d like an invite. Thanks! I’d really like an invite to Toluu if you have one. I’ve been hearing nothing but raves and am eager to try it.